The G.I. Bill after World War II (1939–1945) allowed unprecedented numbers of African Americans to attend art schools. Since African Americans served with distinction in both WWII and the Korean War (1951–1953), they believed opportunities in the arts would improve. Unfortunately, discrimination and racism revived big time during the 1950s. Some African American artists continued to study in Europe. The Civil Rights Movement of the 1960s galvanized black artists, however, into pushing for a revival of exhibitions and studies of African American art in the US. Many groups were formed to address the black artists’ role in modernism, while still highlighting their community and heritage. Jae Jarrell and her husband Wadsworth Jarrell (born 1929) were active in establishing African American art in the forefront of American modernism. During the late 1960s and early 1970s, critics summarily categorized much African American art that addressed injustices in American society as “protest art.” The trend toward positive messages in politically aware art began with the urban mural movement of that period, pioneered in Chicago, which sought to bring not only beauty to urban neighborhoods, but also uplifting, positive messages about African American—and other minority—life. After the painting of the Wall of Respect in Chicago in 1969, a collaboration by numerous artists, five black artists formed the group COBRA (Coalition of Black Revolutionary Artists). They were Jae Jarrell and Wadsworth Jarrell, Barbara Jones-Hogu, Gerald Williams, and Jeff Donaldson. This group emphasized positive images of the strong African American family, and proud and profound members of the black community, rather than documenting injustices meted out by the US government on minorities. Like many artists of the Harlem Renaissance (ca. 1918–1939), these artists produced works that celebrated African American life, neighborhoods, achievements, and their African heritage. The group grew to ten people and the name changed in 1970 to AfriCOBRA (African Commune of Bad Relevant Artists). It was during this period that Jae Jarrell created Urban Wall Suit. Many of the Africans brought to the US as slaves came from West Africa, where there is a long, honored tradition of textile art, woven, painted, and dyed. In Africa, most weavers are men, but in the US, before emancipation, African women became the textile artists, producing quilts, rugs, and clothing, often repeating patterns and motifs from Africa. Jae Jarrell carries on that tradition as a fashion designer. Jarrell is very proud of Urban Wall Suit, especially because it was received with such critical acclaim everywhere she wore it. 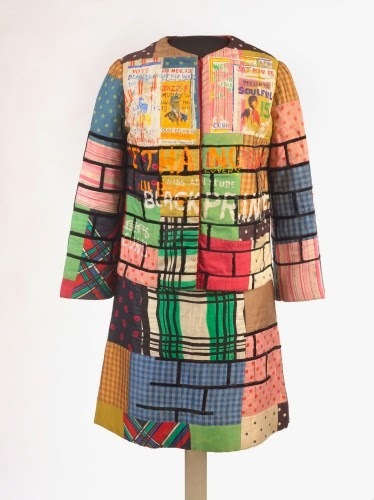 The multi-colored two-piece suit represents a brick wall with appliquéd mortar lines in velvet, with graffiti, posters, notices, and tagging in acrylic paint. These are positive words representing not only black pride, but also carrying on the tradition of African American artists representing their particular neighborhood, and their unique contribution to American culture. 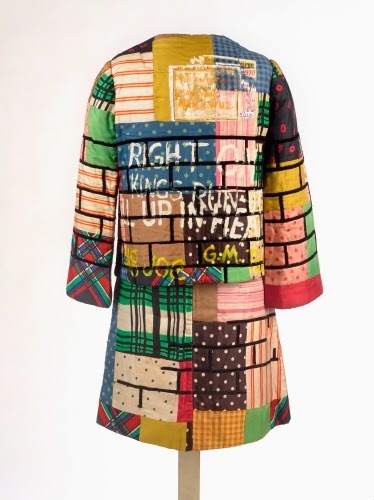 Urban Wall Suit was one of a group of 44 works by 29 African American artists bought by the Brooklyn Museum in 2013 from a collector in Detroit. 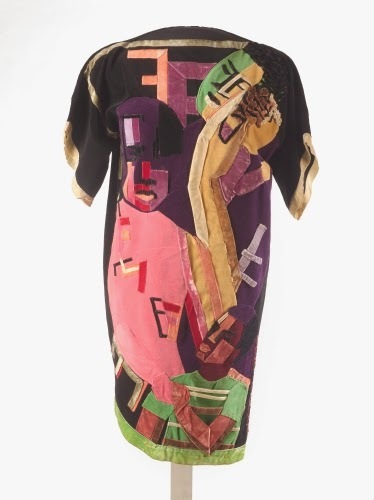 The group of works, including two outfits by Jarrell, bridges the museum’s collection between African American art of the Harlem Renaissance and contemporary African American art. Studio activity: Design an outfit based on family or neighborhood. Using a pencil, draw on a piece of white construction paper the outline of a dress, suit, pants or shirt so that it fills most of an 11 x 8 ½” sheet. Go over the outline with a black felt tip marker. Using color pencils, create designs on the clothing item drawn to reflect personal values, experiences or family history. Try to combine images of objects of personal significance as well as words or sayings that summarize personal feelings.